If you want to maximize the space in your child’s bedroom or you simply have a climber who would love sleeping up high, Plyroom’s Dream Cloud Loft Bed is a versatile, new possibility. The space below the bed can be used for a play area, toy corralling spot, a desk, or even a single bed. Made from FSC-certified, sustainable birch plywood, the durable bed is finished by hand with a non-toxic, water-based coating and is easy to assemble — all that’s required is a hammer. Plyroom prides itself on creating a light, yet sturdy bed that uses only handcrafted wooden pegs and wooden joins. Its neutral hue and uniform grain helps it blend in seamlessly with any bedroom color. It also means that kids can have fun picking out crazy colored bed sheets or other bed accessories that reflect their personality. The bed’s lines are clean and create a serene simplicity in any room (even if they are the only clean thing around). The ladder can be used on either side of the bed, allowing for more varied room arrangement possibilities. We love that the bed can be used throughout childhood with the space underneath serving as a den, fort, or cozy reading nook for little kids and then become a space for doing homework or art when they are older. If you want to maximize the space in your child's bedroom or you simply have a climber who would love sleeping up high, Plyroom's Dream Cloud Loft Bed is a versatile, new possibility. The space below the bed can be used for a play area, toy corralling spot, a desk, or even a single bed. Made from FSC-certified, sustainable birch plywood, the durable bed is finished by hand with a non-toxic, water-based coating and is easy to assemble -- all that's required is a hammer. Plyroom prides itself on creating a light, yet sturdy bed that uses only handcrafted wooden pegs and wooden joins. Its neutral hue and uniform grain helps it�blend in seamlessly with any bedroom color. It also means that kids can have fun picking out crazy colored bed sheets or other bed accessories that reflect their personality. The bed's lines are clean and create a serene simplicity in any room (even if they are the only clean thing around). The ladder can be used on either side of the bed, allowing for more varied room arrangement possibilities. 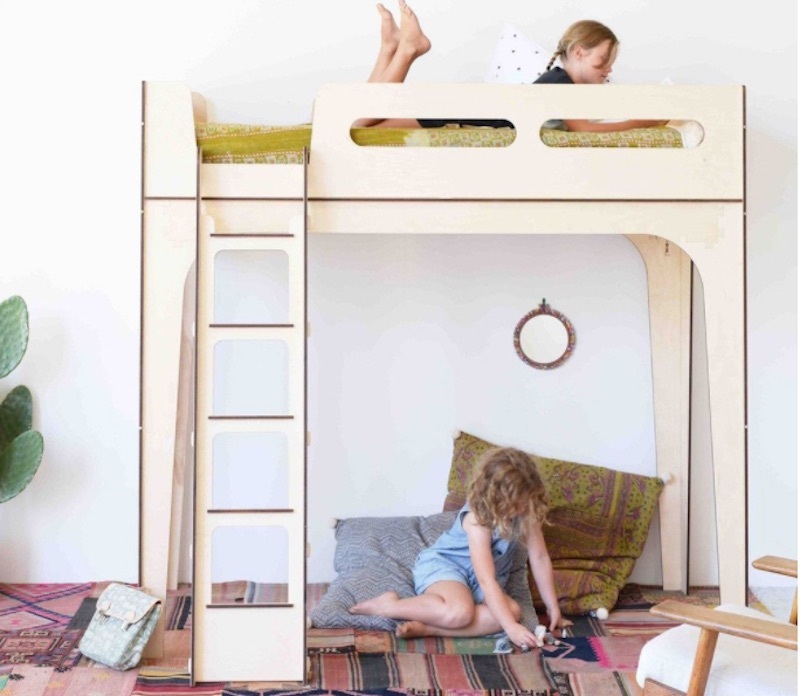 We love that the bed can be used throughout childhood with the space underneath serving as a den, fort, or cozy reading nook for little kids and then become a space for doing homework or art when they are older.